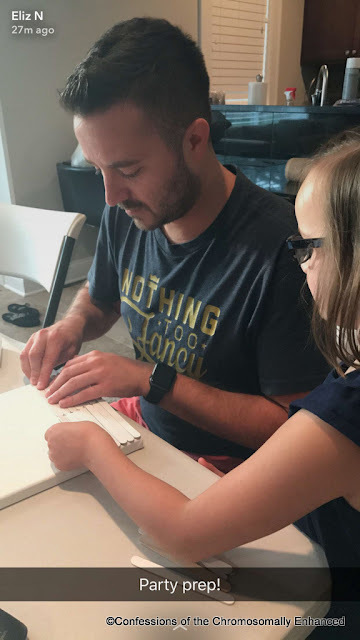 Disclaimer: While this blog is typically devoted to the chromosomally enhanced members of our family, an exception must be made just this once. It all started with a little note. Merryn, bless her heart, left me a note and $5 of her own money, asking to go on a "Mom + Merryn" date for birthday party supplies. With it, she left a list of her desired supplies. 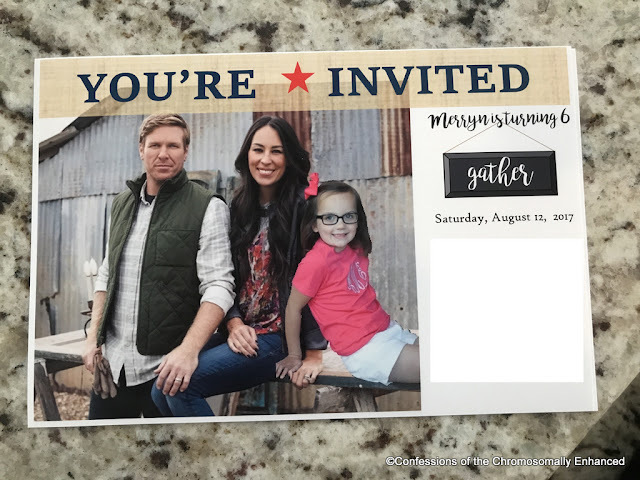 You see, Merryn has been talking about a "Fixer Upper" themed birthday party for months. "Fixer Upper" is Merryn's favorite show. We don't watch much tv around here but when we do, that's what she wants to watch. Why would a five year-old be interested in an HGTV show about remodeling houses? Heck if I know. The kid is essentially a 40 year-old trapped in a 5 year-old's body. She is an old soul; mature beyond her years, considerate, intelligent, kind and compassionate. And even though I don't have a crafty bone in my body, and a trip through Michael's gives me major anxiety, I was committed to making this happen for her because she is so deserving. 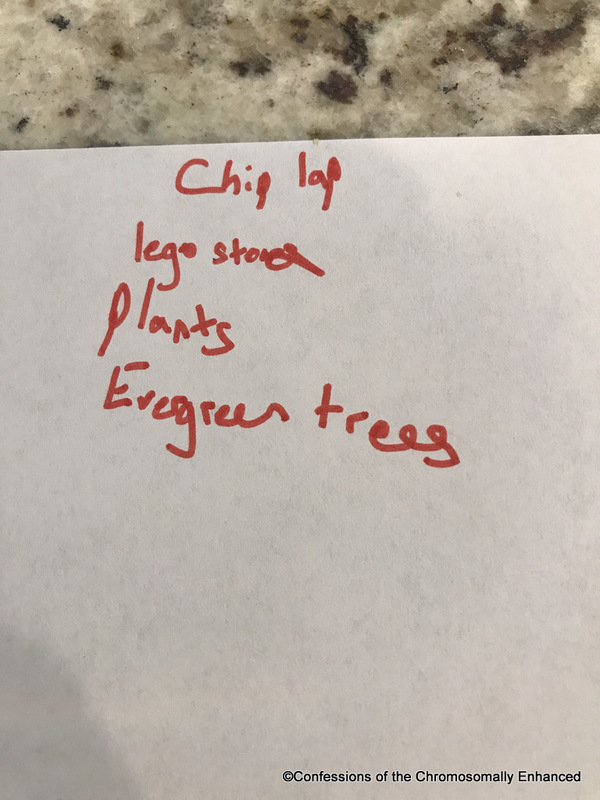 I posted these sweet notes to Instagram asking for suggestions on how to implement a "Fixer Upper" themed birthday party for a six year-old. So many creative suggestions came pouring in along with one incredible surprise that will be revealed in Part II of this blog post. Then Travis left town for his dream vacation of golfing for a week in Scotland with his dad and brother. He left me some birdhouse kits that he'd purchased and asked if I was confident handling the rest of the party planning. No, not really; but fortunately, I have some incredibly creative friends who led the way. We made a list and went to Michael's and she whizzed around grabbing things from various aisles while I breathed into a paper bag and repeatedly asked "Can we go home yet?" Let the party planning commence. It's all hands on deck when it comes to throwing the ultimate "Chip & Jo" party. First project: create a pinata using paper mache. For a mess averse mom, this process required me to dig deep into my patience reserves. Thankfully, Cousin Abby was in town with YaYa and she rolled her sleeves up and dove right in. Major thanks to Cousin Abby! 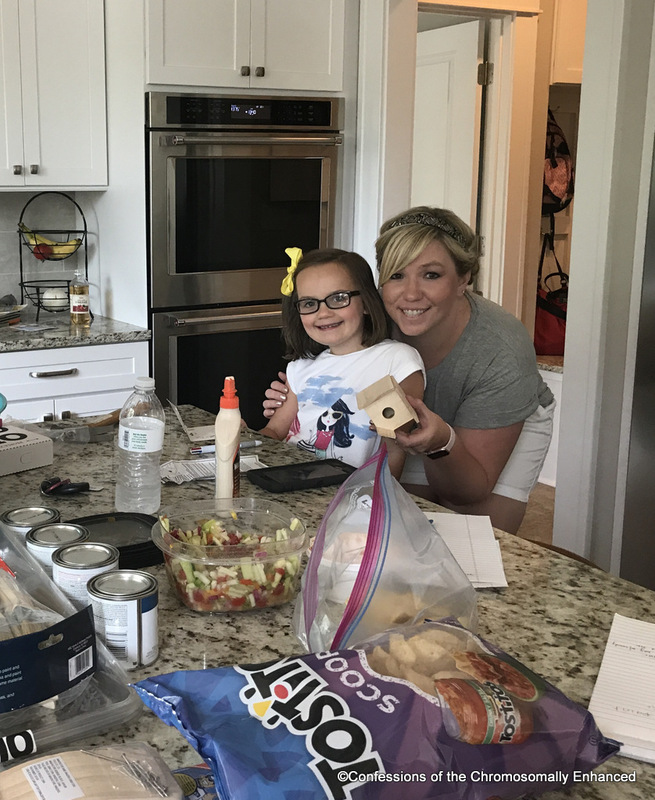 Of course you can't have a "Fixer Upper" party without shiplap (or "Chiplap," as Merryn calls it). Erin couldn't believe that I've never spray painted before. 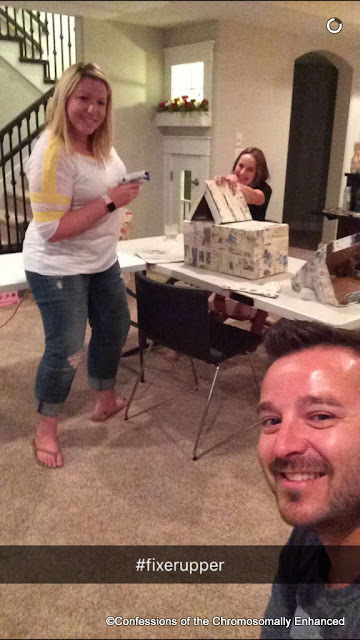 Then of course we had to hot glue the paper mache pieces together to form a house shaped pinata in honor of "Demo Day" This was one of many late nights that myself, Erin, and my wonderful neighbor, Kyle, spent party planning. Of course Merryn wanted to be involved as much as possible and she did a terrific job with her assigned tasks. Finally, it came down to the wire, and we had all of the elements we needed to carry out this awesome soiree. Erin even raided her wedding decor for lanterns and mason jars and photo back drops to help create ambiance. Kyle set up the decor, adding lighting, signs, and a gorgeous display of food. Mama Hop spent the morning of the party cooking. ...and Aunt Leanne in town. Tune in next time where we reveal all of the party pictures and videos including the one surprise that Merryn will remember for the rest of her life. I love that so many people pitched in to make this happen for your sweet girl! Cannot wait for part 2 of the story! And the house pinata for demo day? Genius. Okay my favorite program also, and looking forward to seeing how the party went! So much creative talent went into that party planning. I'm so excited to see 'the one surprise'!! Sounds like you all organised an amazing party. I can't wait for part 2 with the big surprise. Merryn seems like such a wonderful little girl & seeing her get a special surprise will be lovely.